The electron sea Model In this model a metal is assumed to consist of a lattice of positive ion (or kernels) immersed in a sea of mobile valence electrons, which move freely within the boundaries of a crystal. A positive kernel consists of the nucleus of the atom together with its core on a kernel is, therefore, equal in magnitude to the total valence electronic charge per atom. The free electrons shield the positively charged ion cores from mutual electrostatic repulsive forces which they would otherwise exert upon one another. In a way these free electrons act as ‘glue’ to hold the ion cores together. The forces that hold the atoms together in a metal as a result of the attraction between positive ions and surrounding freely mobile electrons are known as metallic bonds. Through the electron sea predated quantum mechanics it still satisfactorily explains certain properties of the metals. The electrical and thermal conductivity of metals for example, can be explained by the presence of mobile electrons in metals. 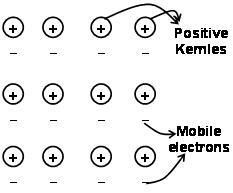 On applying an electron field, these mobile electrons conduct electricity throughout the metals from one end to other. Similarly, if one part of metal is heated, the mobile electrons in the part of the metals acquire a large amount of kinetic energy. Being free and mobile, these electrons move rapidly throughout the metal and conduct heat to the other part of the metal. On the whole this model is not satisfactory. Hydrogen should be linked to a highly electronegative element. The size of the electronegative element must be small. These two criteria are fulfilled by F, O, and N in the periodic table. Greater the electronegativity and smaller the size, the stronger is the hydrogen bond which is evident from the relative order of energies of hydrogen bonds. Hydrogen bonding plays a vital role in physiological systems. Proteins contain chains of amino acids. The amino acid units are arranged in a spiral form somewhat like a stretched coil spring (forming a helix). The N-H group of each amino acid unit and the fourth C=O group following it along the chain, establishes the N–H---O hydrogen bonds. These bonds are partly responsible for the stability of the spiral structure. Double helix structure of DNA also consists of two strands forming a double helix and are joined to each other through hydrogen bond. These can be evident from the following examples. Example. H2O is a liquid at ordinary temperature while H2S is a gas although both O and S belong to the same group of the periodic table. Solution: H2O is capable of forming intermolecular hydrogen bonds. This is possible due to high electronegativity and small size of oxygen. Due to intermolecular H-bonding, molecular association takes place. 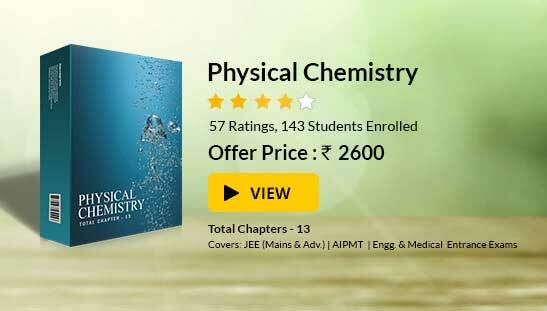 As a result the effective molecular weight increases and hence the boiling point increases. So H2O is a liquid. But in H2S no hydrogen bonding is possible due to large size and less electronegativity of S. So it’s boiling point is equal to that of an isolated H2S molecule and therefore it is a gas. Example.Ethyl alcohol (C2H5OH) has got a higher boiling point than dimethyl ether (CH3-O-CH3) although the molecular weight of both are same. Solution: Though ethyl alcohol and dimethyl ether have the same molecular weight but in ethyl alcohol the hydrogen of the O-H groups forms intermolecular hydrogen bonding with the OH group in another molecule. But in case of ether the hydrogen is linked to C is not so electronegative to encourage the hydrogen to from hydrogen bonding. Due to intermolecular H-bonding, ethyl alcohol remains in the associated form and therefore boils at a higher temperature compared to dimethyl ether.